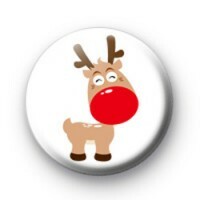 Cute Rudolph the Red-Nosed Reindeer on a white background Button Badge. This is a really cute illustration of Rudolph the red nosed reindeer. This Christmas reindeer badge is just too cute and they are really popular with younger children and school pupils, we have quite a few reindeer designs in the shop if you need a few more options and they're all super festive. Standard 25mm badge handmade in our UK workshop.